You did it! Those of you who volunteer did an incredible job this last year! 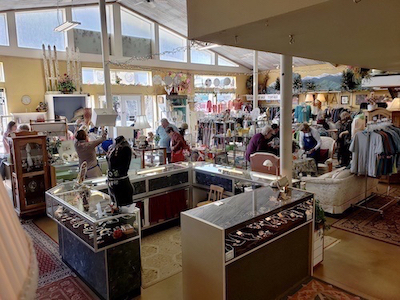 Without your hard work at Bizarre Bazaar we never would have reached such levels of success, reflected in the amount of funds we will be dispersing to the Bonner County community in grants and scholarships. From the bottoms of our hearts we thank you! You are amazing. Tis the time of year when folks are gearing up for their own personal garage sales and that means the level of incoming donations will be increasing. This is a busy time of year for us and we are looking for some energetic volunteers to step up and help us get the stuff on the floor. Got an hour or two? Stop by and lend a hand! We look forward to seeing you. With the changing of the seasons, we are currently in full Spring mode. Please, please, please be thoughtful of what you put out. We are totally over corduroy, wool, or anything that smacks of Winter (cue dark music here). However, this being North Idaho, we are not quite ready for sundresses, sandals, shorts or linen. If it is raining, chances are no one is going to buy shorts! And please feel free to share your personal donations with us! However, as in past seasons, we do not have room to store your out-of-season donations. Currently we are looking for Spring and Summer and sorry to say, those heavy sweaters and coats should hang out at your house for a few more months. A couple of housekeeping notes – please do not turn off the lamps and plugged-in track lights at the fixture. Almost every fixture is plugged into a surge protector and can be shut off there with a toggle switch. It becomes confusing for the morning crew when the lights are turned off in different ways. FYI, there is an updated lighting guide at the cashier station, along with the “Opening/Closing” instructions. Also, the lights around the front windows are never turned off! There were timers on them, but too many people were turning them on and off manually and the timers lost their mojo. We have several new members! This is a wonderful thing and it makes us happy. If you are one of above-mentioned ladies and are interested in a little one-on-one training with either Diane or Cherie, please let one of us know and we will be happy to accommodate you. A note to all: We are planning a full-on multi-station training sometime this fall for anyone interested, date and time will be announced later. Thank you all for being so incredible!